Home > Laser COLOR > GREEN Laser Pointers > Green Laser PRESENTATION Pointers > US AIR FORCE - Aim High! US Air Force Briefer - Aim High! Z-Bolt® MBP-5 Military Pride Green Laser Pointers feature our proprietary design "Double Tap" control circuit. "USAF" on pointer clip. "USAF Roundel" on laser tube. Lanyard & end cap included. Z-Bolt® MBP-5 Military Pride Green Laser Briefing Pointers feature our proprietary design "Double Tap" APC control circuit for added function and power output stability (see below). Operate in two (2) modes - hold down thumb for momentary push button activation; "Double Tap" for constant on use. 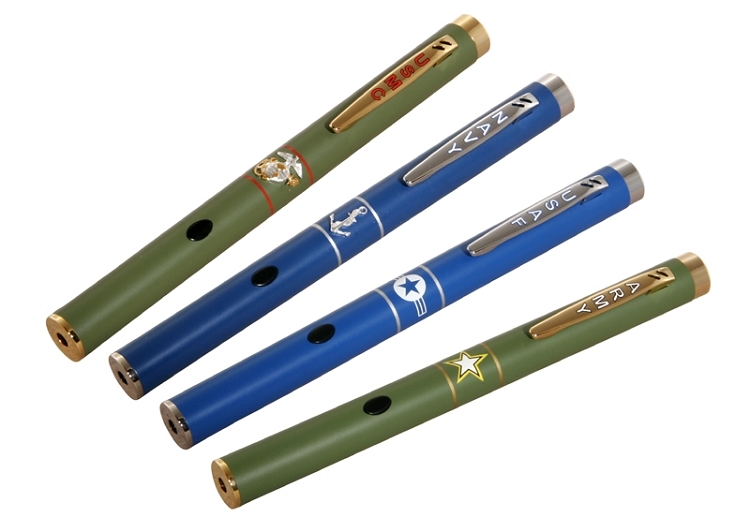 USMC, USAF, ARMY, or NAVY Service Branch designs on laser tube and clips. Ships in complimentary satin and black felt lined travel & carry case. 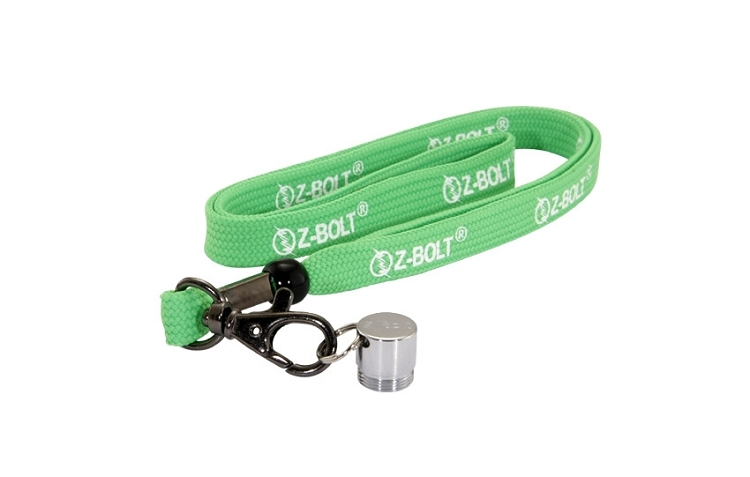 Includes green nylon Z-Bolt® lanyard, special accessory end cap with lanyard loop ring. The MBP-5 is constructed of high quality brass and includes IR filter and glass lens for superior laser performance. The MBP-5 includes our special APC control circuit. The computerized APC diode drive circuit features "Automatic Power Control". This advanced circuit is based on a photo diode feedback loop. The photo diode monitors the optical output and provides a control signal for the laser diode, helping to maintain the diode operation at a constant optical output level. The circuit adds to the lifetime of the laser, prevents overheating, and provides overall power output stability & efficiency. Custom order 10 or more Military Pride Laser Pointers - decorate with unit shoulder sleeve patches, insignias, seals, beret flashes, etc. 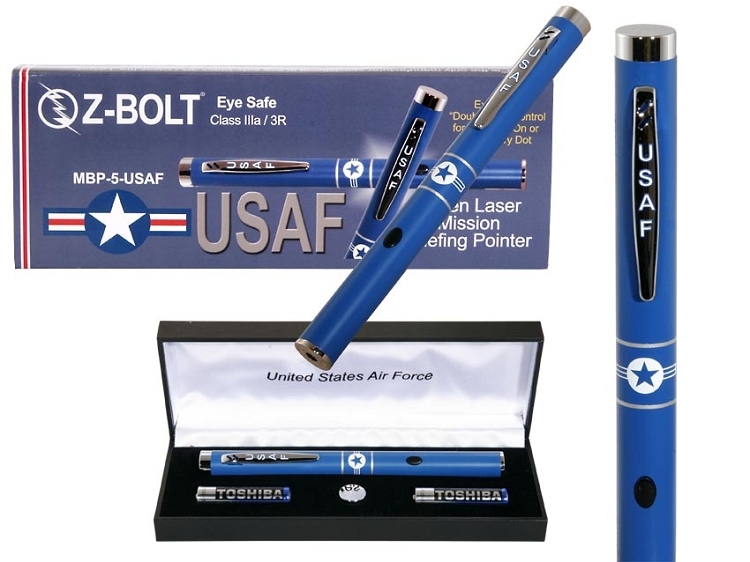 Customization options include Service Specific laser tubes & carry cases - imprinted clips, personalized names & high resolution unit insignia - exclusively assembled & manufactured by Z-Bolt.